I just don’t see how your bed doesn’t just light on fire! We started our day with a delicious brioche breakfast. It had been quite a surprise yesterday when we had visited the lobby to use the Internet and the man at reception gave us directions for how to get to breakfast. The hotel has no common area for serving a continental breakfast so they have cut a deal with a cafe around the back of the building. When we got there we just had to hand over some tickets reception man had given us and we were presented with a brioche & hot beverage each. Free breakfast is the best. 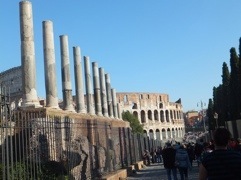 After eating, we walked to the train station and caught the metro to the Colosseo stop. Can anyone guess what we saw when we emerged from the station? 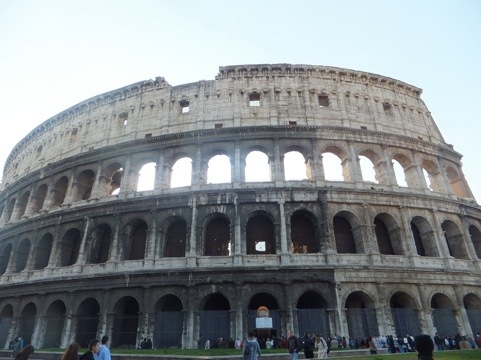 The most famous building in Rome has to be the Colosseum. This building is 2000 years old and is an example of perfect Roman engineering. 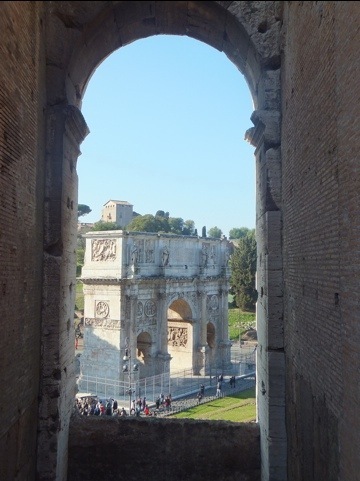 The Romans pioneered the use of concrete and the rounded arch which allowed them to build on such a grand scale. But with function you sometimes lose the fashion, and the Romans weren’t the best at making things look nice. To fix this they added some Greek columns for esthetic value. From the outside the building looks incredibly impressive. The arches stack up perfectly for 3 stories of architectural marvelousness. We did a whole lap of the place to see it from all angles. The north side has remained the most intact; it still has it’s top floor. 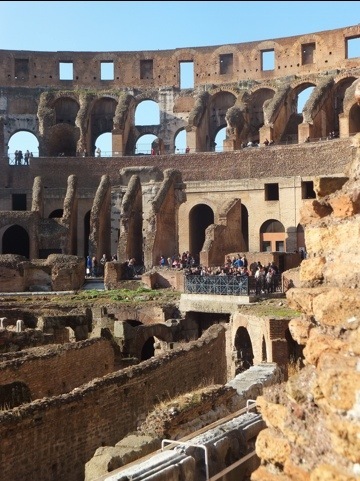 The Colosseum was built in 80 AD when the Roman Empire was at its peak. It was an arena for gladiator contests and public spectacles. Killing had become a spectator sport and the Romans wanted to share the fun with as many people as possible. 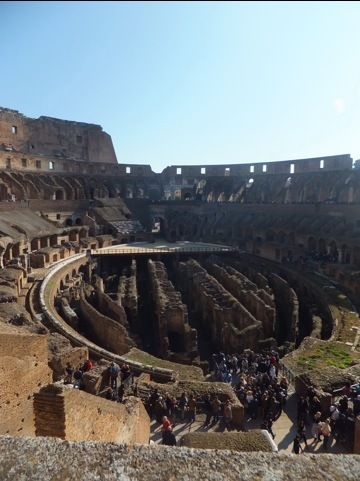 At its height, the Colosseum could accommodate 50,000 roaring fans and entrance was entirely free. In the present day we had to pay to get in, but it was definitely worth it. The interior is more what you picture when you think fo ruins. There is only one small section that contains any seats, and those are a reconstruction. You have to use your imagination to picture how so many people could sit & watch the games. What wasn’t hard to see though were the structural components. Without floors & seats covering them, all of the arches and support columns are on full display. You don’t think about how strong a simple Roman arch is until you see 3 more stories of arches, floors and various other stones stacked on top of it. Gladiators, criminals and wild animals fought to the death here in every conceivable scenario. There was beast vs beast, man vs beast and the main event: man vs man. The floor has been reconstructed at one end to give you an idea of the depth of the lower level where the animals were kept before they were lifted up in elevators. The animals (including lions, tigers, bears (Oh My!) and other exotic creatures) would pop out from behind blinds into the arena…the gladiator didn’t know where, when or by what he’d be attacked. Gladiators were the modern day equivalent of star athletes, they even had there own fan clubs and cheering sections. The underground passageways really were a treat to see. It is a vast maze of cages, cells and open spaces for warming up. The Arch of Constantine is important for anyone who is a Christian, was raised a Christian or is simply from a Christian nation. This arch, from 312 AD, marks the turning point in history where Emperor Constantine defeated his rival and made Christianity the religion of the Empire. Almost over night it went from being illegal to worship Christ to being illegal if you didn’t. The arch is a hulking big piece of white marble. In itself it is impressive, but it is made all the more picturesque by it’s placement, right between the Colosseum & Palantine Hill. 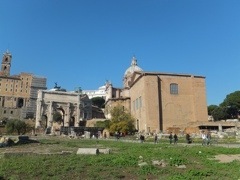 The Roman Forum is ancient Rome’s birthplace and civic center. In the Roman empire, the forum was the center of any city (much as present day Italian cities revolve around their piazzas) and as Rome was the center of the empire, this set of ruins was really the core of the entire civilization. In other words, although it may look like a crumbly bunch of bricks it was a huge deal in history. Walking around it’s hard to picture what this place would have looked like all those years ago. 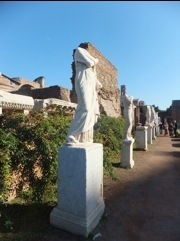 The forum would have been full of blinding white marble buildings with 40 foot high columns and shining bronze roofs, as well as rows of statues painted in realistic colors. Each end is marked by a large white arch. They are similar to that of Constantine but celebrate instead Titus & Septimus Severus. They were two other emperors, the first of early Rome and the second during it’s decline. A couple of other things stand out on the almost flattened area: The Senate House stands as the only whole & operational building…due to the fact that it was converted into a church upon Rome’s fall. The Basilica of Constantine stands towering over everything else, despite the fact that it is only a fraction of it’s original size. All that is left now are a triplet of the most massive arches we have ever seen and will probably ever see in our lives. The Temple of Julius Caesar is where Caesar’s body was burned after his assassination. There are constantly flowers on the site…given to remember the man who, more than any other personified the greatness of Rome. Although publically Julius Caesar refused the laurel headdress that would have made him sole leader of Rome, privately he slowly abolished the power of the senate until he ruled as a dictator. This ushered in a new era of control for emperors during which their title changed to “Ceasar”. Though loved by the masses, not everyone liked him. In the end he was ambushed and stabbed to death by a conspiracy of senators. The temple where he was burned is not an overly impressive sight; it is the significance of it that really hits you. People worship this political leader like he was a god! Not something that would happen today, that’s for sure! The Temple of Vesta is perhaps Rome’s most sacred spot. As long as the sacred flame burned, like the fire at the center of a Roman home, Rome would stand. The flame was tended by priestesses known as Vestal Virgins. These women were chosen from noble families before they reached the age of ten. The 6 Vestal Virgins would serve a 30 year term in which they took a vow of chastity. If she served her term faithfully she was given a huge dowry and allowed to marry. However many women found it difficult to keep there virginity. If found out, she was strapped to a funeral car, paraded through the streets if the forum, taken to a crypt, given a loaf of bread and a lamp and then buried alive. Yikes! Their sacred home is still a lovely garden with large reflecting pools & statues of those women who were able to retain their virtue. 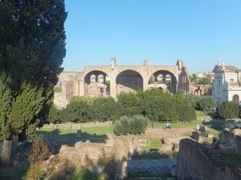 Palatine Hill, located above the forum is full of even more history and ancient ruins. This was where the emperors lived. The hill was once so filled with palaces that later emperors had to build outwards & downwards. 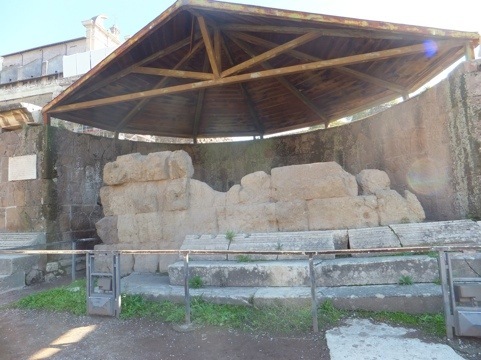 On the hill we saw the remains of the Imperial Palace, the huts of Romulus and Remus (orphaned twins who legend tells us were raised by the she-wolf on Palatine Hill and founded Rome) and the House of Emperor Augustus, which we were able to enter and see newly discovered frescoes. 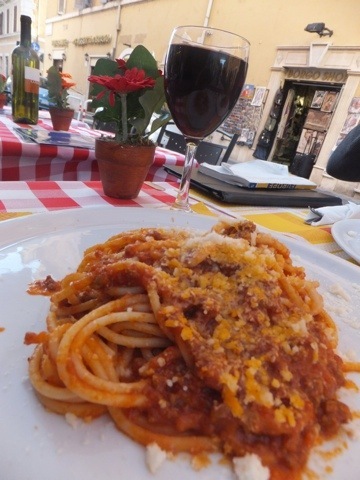 By the time we finished with the ancient sites it was well past lunch time & we were starving. We found a place on a side street and sat down for some pizza. 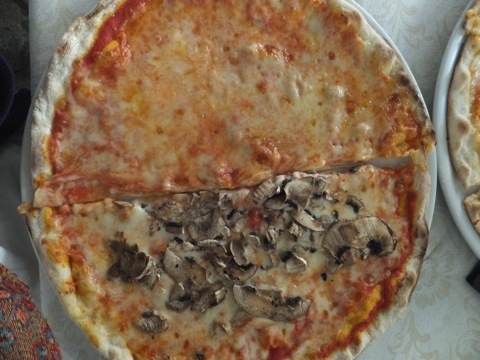 We were back to Italian thin crust, versus the raised crust required to hold in the pizza soup served in Naples. We went halvesies on a margherita & mushroom. We spent our afternoon in the only way we know how in Rome, apparently. 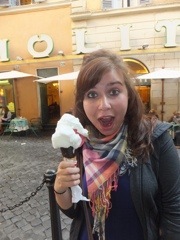 We sat at the Trevi Fountain for over an hour and then on the Spanish Steps for almost two. In between we wandered the streets that link the two sights and did some stellar shopping. Couple more Christmas presents checked off the list…including a couple of gifts for ourselves 😉 Eventually it got dark and we meandered to the fountain again. It looks beautiful when it’s all lit up! For supper we found a place not far from the fountain, but far enough that it wasn’t crazy expensive. It was still a touristy enough area though that we didn’t have to eat alone for once! 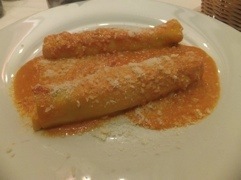 Kristin had cannelloni, as it was on her To Eat Before we Leave Italy list, and Justine had tortellini with mushroom & cream sauce. The portion sizes look small but we were both stuffed by the time we finished! 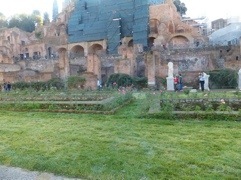 – The word ”palace” comes from Palatine Hill, because this was where the Emperors chose to live. 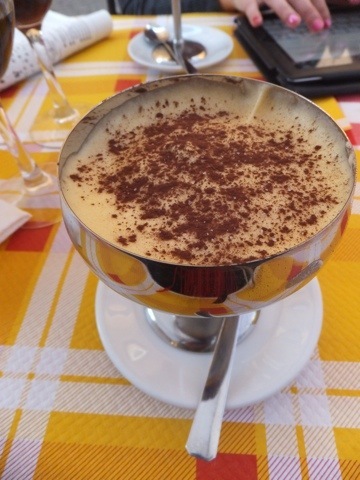 – You cannot walk around Italy in a white & red or white & blue striped shirt…you just look like you should drive a gondola. We had a gondola man (or man who dresses like he wants to be one!) 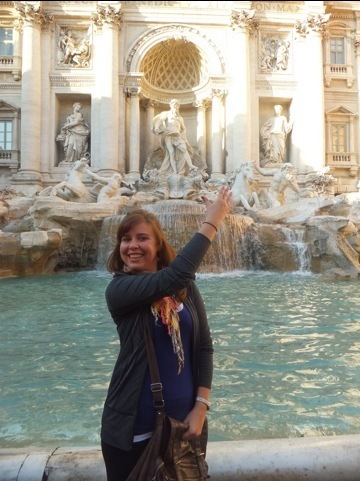 spotting at the Trevi Funtain today. – But also haggling with a street vendor so that instead of getting two bags for €45 each we got two bags for €40 total. And because it’s been awhile, how about a participation question!?!?!? The two of us have found this young adult book series that we enjoy listening to the audiobooks of at work. It’s called Percy Jackson and is about Percy who is a Demi-god. A Demi-god is a person with one human parent and one God parent. Now it’s research time! We want you to look into the Roman gods, and the Greek ones who they are originally based on. Now imagine that we are all Demi-gods…based on our personality traits who do you think our Godly parent would be & why? And how about you…who do you think your Godly parent would be? If you answer for both us and yourself we will give you lots of points & maybe even reply with who we think your parent would be! It’s not a country unless Telus tells us it is! Today we visited country number 17! Well it was country #17 for Justine…for Kristin it was #18 since Telus texted her that she went to Croatia… But this is all besides the point… Today we went to another country, without really ever leaving Italy! Vatican City is a tiny independent country of little more than 100 acres. The Vatican has it’s own postal system, armed guards (called the Swiss guard & who have the most ridiculous outfits ever), helipad, mini train station and radio station. Being so small in size, the Vatican is religiously powerful, being the capital of over 1.1 billion Roman Catholics worldwide. 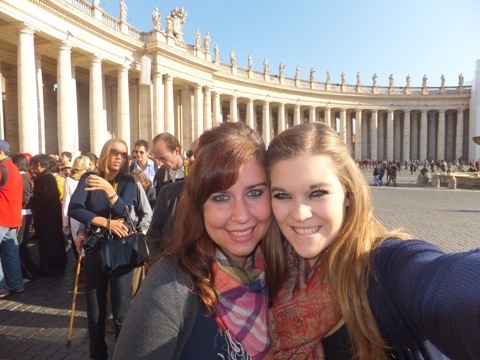 The Vatican is the home of two main sights: St. Peter’s Basilica and the Vatican Museum with the Sistine Chapel. 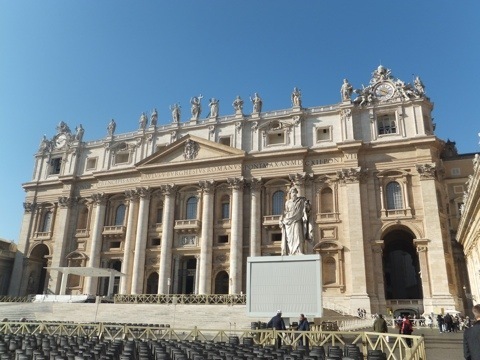 St. Peter’s Basilica is the richest and grandest church on earth. The atrium itself is bigger than most churches. There are actually markers on the floor telling you where other churches would end if they were placed on top of it. From the outside it looks like a hulking palace of a place. The dome points up above a great columned portico. The white columns at the entrance date from the first church on this site in the 4th century. 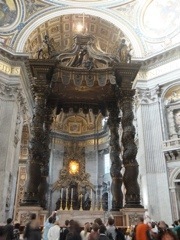 A highlight in the church is the main altar which sits directly over St. Peter’s tomb and under the fabulous seven-story bronze canopy designed by Bernini. This is a marvel of carving with intricate designs running all the way up to the cross studded top. Then behind it lies a stunning stained glass window depicting a dove in the golden sunlight. Surrounding it is a mass of golden statuery that appears to be both drawn into the light and overcome by it’s intensity. Basically, it’s beautiful! But that is just the center of the curch. Below lies a crypt containing the bodies of centuries worth of past popes. Each side of the Greek-cross shaped church is lined with biblical figures, candles to be lit and small altars ready for prayer. 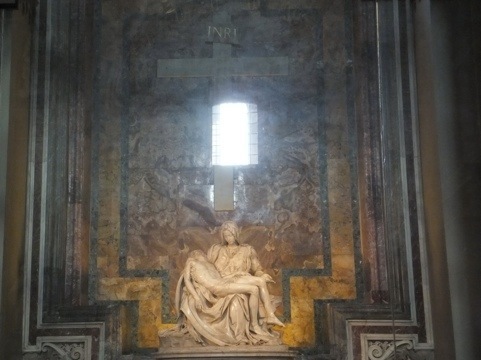 Many of the works found here are world famous, but none more so than the Pietá. Michelangelo sculpted his Pietá (any work that represents Mary with the body of Christ taken down from the cross) when he was only 24. This one is so well loved and protected it’s kept behind bulletproof glass. Once we had absorbed the majesty of the church we climbed the 551 steps to the top of the dome. 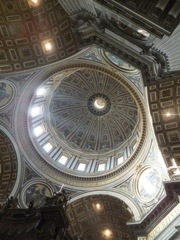 This dome was Michelangelo’s last work and is the biggest anywhere. 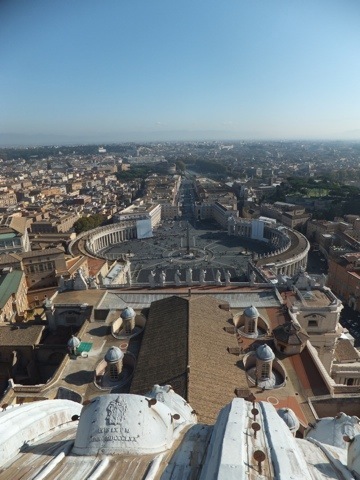 It is such a feat of engineering and even the present day Romans are so proud of it that no buildings in Rome can be taller than the dome of St. Peter’s….its actually a law. The dome is huge, taller than a football field is long. And it takes a lot of energy to climb…but we did it…even with Kristin’s reduced lung capacity. In the end we decided it wasn’t even the hardest climb we’ve done on this trip. The view from the top was spectacular. 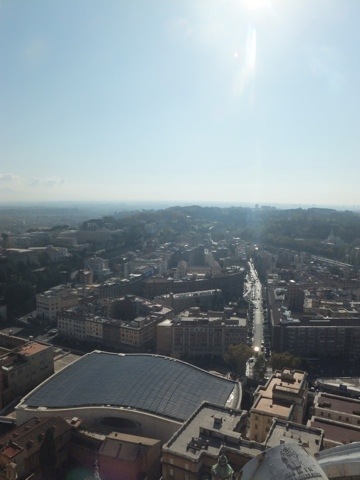 You get a great view of the Vatican, with it’s key shaped square & enormous museum, and of the vast expanse of Rome. It really is a sprawling city…just not for us tourists who just want the ancient part. 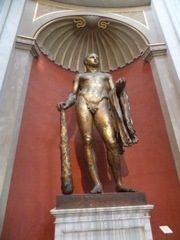 The Vatican museum is big, over 4 miles of ancient statues, Christian frescos and modern paintings. 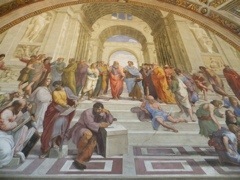 They all culminate in the end at the Raphael Rooms and the Sistine Chapel. We had heard from the Padget parents that this place could be super busy…when they were there they were walking shoulder-to-shoulder with those around them. We were ready for a long line & packed exhibits…then we were suddenly inside… Apparently the line-up runs along the sidewalk and we had wandered into it, but it was moving so fast that we had just thought it was a busy street. We were into the building, through the ticket line & at our first gallery with zero wait time. First up was statues. The collection of Greek and Roman statues contained many originals but even more Roman copies of Greek originals. To put this in laymens terms, there were really old statues that were actually just knock-offs of even older statues. Interestingly, one of the Popes was not a fan of the naked men scattered about. 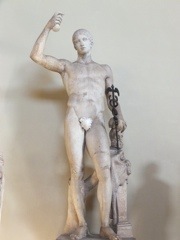 To remedy this he had all of their privates hacked off and the resulting nothingness covered up by a fig leaf. The Raphael Rooms are filled with frescos, which are actually paint mixed with plaster so are considered part of the wall and not paintings. 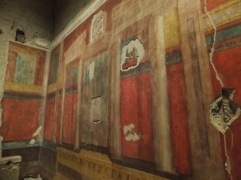 These rooms were frescoed by Raphael and his assistants. This series of chambers is exquisite to walk through, even for “art for dummies” folks like us. The use of color and the realistic nature of the people was a wonder to behold. Finally you come to the Sistine Chapel, the Pope’s personal chapel and also where a new Pope is elected. The chapel is famous for its paintings by Michelangelo, who spent 4 years on this work. The roof is a perfect depiction of the story of creation. 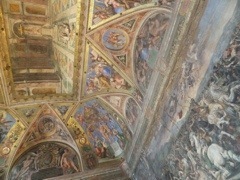 Also one wall is covered with a painting of the Last Judgement. As in all similar paintings the message is clear: Christ is returning, some will go to he’ll and some to heaven. This place was just incredible. We stood and stared for so long because there is so much to take in & all of it is worth seeing. The details & dynamics of the paintings are so amazing that you understand how this work of art could inspire many of the ideas coming out of the renaissance movement. 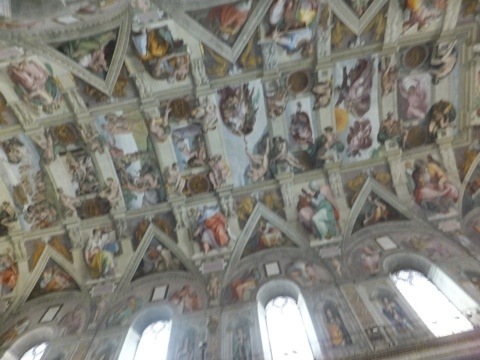 Sorry the photo is a bit blurry…you’re not actually allowed photos in the Sistine Chapel so this was a sneaky one! Leaving the Vatican we slowly meandered our way through the streets of Rome. We popped into some tourist shops and bought some souvenirs off the street. We’re on the last leg of our trip and need to finish up souvenir and present buying! 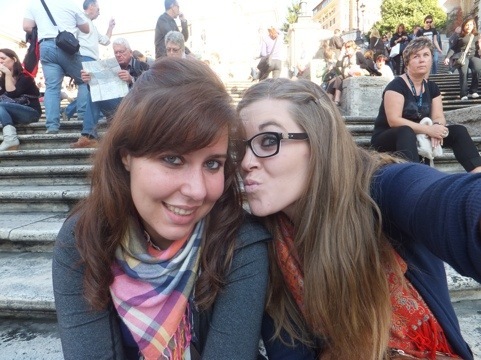 Eventually we made our way to the Spanish steps where we partook in our favorite pastime of sitting on steps and writing some blog post. It was crazy to watch the scene on the street below. 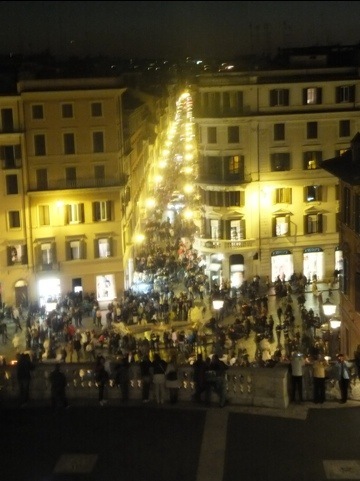 There was hardly room to walk on the streets, yet once you climbed up a few steps there was hardly anyone around. We couldn’t understand why more people weren’t just loitering on the steps…we swear it’s good fun! It was slightly chilly on the Spanish steps so we headed back towards our hostel, looking for somewhere for supper along the way. We wandered the streets near our home looking for a place that was a) open and b) had people eating at it. We only succeeded on the first point. Like we have many times already, we ate supper alone. 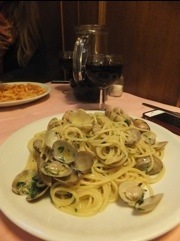 Tonight Justine dined on spaghetti & clams while Kristin has gnochetti with tomato sauce & sausage. 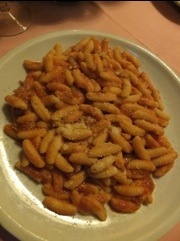 We weren’t sure what gnochetti was, but since Kristin likes anything with sausage she thought it was a good choice. 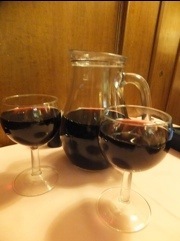 The meal was topped off with some wine…an entire litre of wine to be exact…a wonderfully cheap liter of wine! By the time we had finished eating (and drinking all our wine) other people has finally started to come to the restaurant. Crazy Italians who eat so late! At this point we were a little giddy and didn’t really care if we were alone of not. 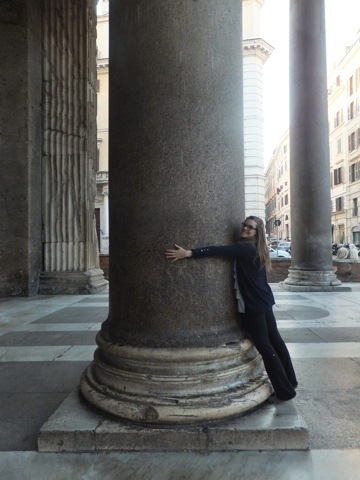 Tomorrow is ancient Rome…and Kristin can hardly contain her excitement! I’m talking to my gum…obviously! This morning we packed up and headed out on the rails again. 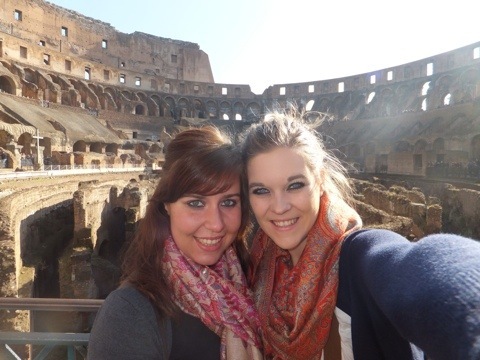 It was a short trip though, only and hour & 10 minutes and we were in Roma! After 2 visits and multiple cities we have finally made it here…not that we ever doubted we would. All roads lead to Rome, after all. Once we’d arrived we had a quick lunch at our favorite Italian eatery: AutoGrill! They had one at the train station so Justine grabbed a hunk of pizza & Kris ordered a sandwich. Once we were fed we checked into our hostel, however the rooms weren’t going to be ready until 2pm. That was fine, we were in no hurry to move in. They did let us dump our bags though (as every good hostel does) so we could hit the town. First stop: National Museum of Rome. 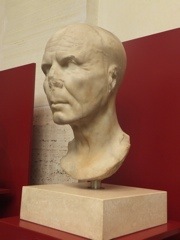 Ok, maybe the Romans weren’t making busts of Voldemort, but many of them resemble him due to their lack of noses. It seems a nose is a hard thing to keep while being lost/buried/neglected for thousands of years. 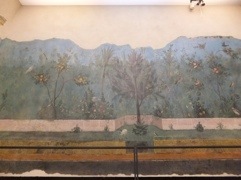 To accompany the statues were paintings, mosaics, a super old & rare coin collection and reconstructions of the frescos of rooms found in unearthed roman homes. Our audio guide at the last museum left us so informed that we were able to name the styles each fo the rooms were decorated in. Go us! One room recreations had a 360 degree forest scene painting and extremely comfortable stools in the center. We carried out an interesting experiment as to how a change in perspective changes a piece of art. 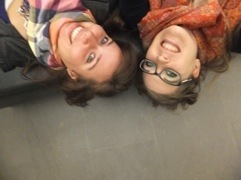 We may or may not have been doing this by laying on the stools with our heads upside down. Upside down it looked more like an underwater scene. The National Museum is located right next to the train station. Right next to the train station is also a metro stop. 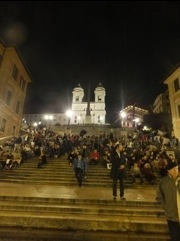 And right next to another metro stop are the Spanish steps. This was the pattern of our next journey. 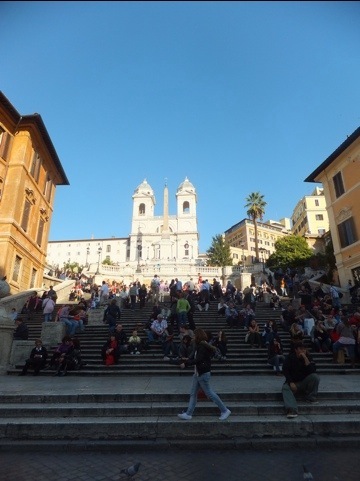 The Spanish Steps are really just a large, long set of stairs leading up to a church in Piazza di Spagna. They are named for the nearby Spanish Embassy to the Vatican, which has sat there for over 300 years. But even though they are nothing more than stairs they are one of Rome’s iconic landmarks. Tourists & locals alike sit & visit on them, and they have played host to the ponderings of many famous romantics such as Keats, Wagner & Lord Byron. We enjoyed them for their “loitering in a public square” potential. We didn’t really have a set plan for this day so we walked at random through the Roman streets. 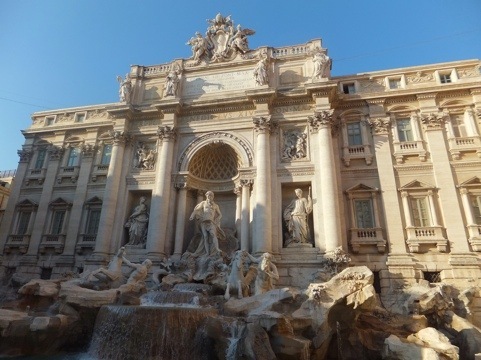 By chance we came across a legandary sight… The Trevi Fountain was built in 1762 on commission of the pope to celebrate the reopening of one of Rome’s large aqueducts (Do we all remember our lesson on what aqueducts are? If not refer to “Acquasparta! or Three men just forced their way into the romantic room…”). 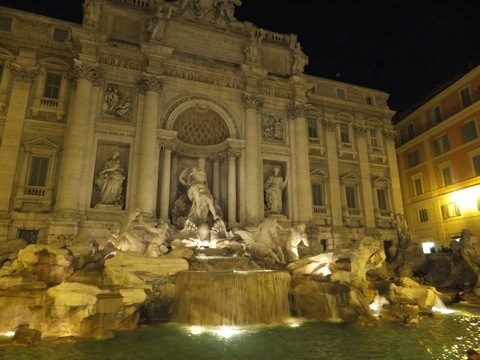 All of Rome’s fountains are powered by aqueducts and the one that was being reopened is now used to supply the 24 spouts of the Trevi Fountain. Although there’s not much to do there and it’s crawling with tourists this was a sight worth seeing. For one, it’s iconic. 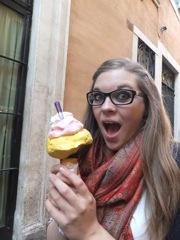 Secondly, it’s featured in the Lizzie McGuire movie. And (C), you have to do your good luck coin toss or you haven’t had the full Roma experience. We snapped photos, then made our way down to water level for pictures of the coin toss (both real & reenacted). 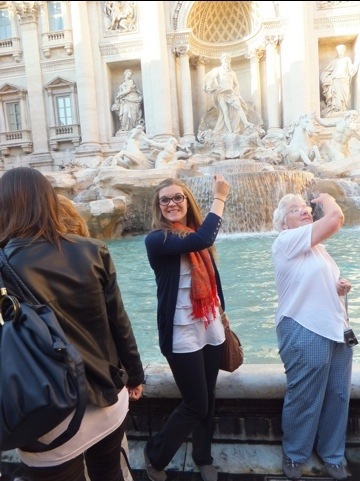 Using your right hand to throw over your left shoulder, you toss your coin blindly behind you, hoping you hit the fountain & not some other unsuspecting tourist. 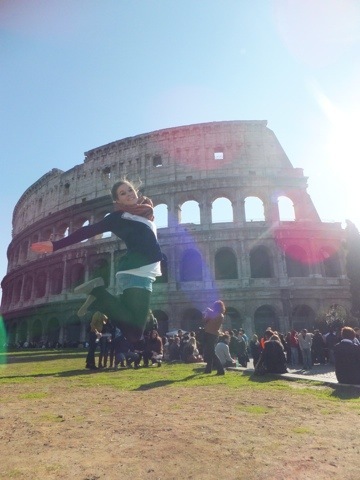 We threw 2 Euros…one for good luck & to guarantee our return to Rome, and one for good luck in finding true love. Justine is considering finding another €2 to throw in if it will solidify the last part. Since our wanderings had already covered half of it we decided to follow Rick Steves’ walk through tourists Rome. 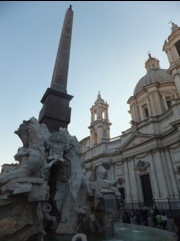 It took us past many a square, multiple fountains and a whole mess load of columns/obelisks. Two of the coolest things were the Egyptian Obelisk and the Four Rivers Fountain. 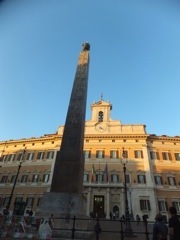 The obelisk was taken by emporer Augustus after he defeated Mark Anthony & Cleopatra…so it’s super old! Now it works as a sundial in front of the Italian Parliament…which may be empty now that their President resigned. (As a side note, there are a lot of police around in Rome right now and we think this might be why…we are all for heading off riots before they happen, so power to you Carbinari!) The fountain was built in 1650 and features four male statues representing the major river in each of the four continents that had been discovered at that time. With St. Agnes church as a backdrop it was very picturesque! Rick’s walk took us right by the Pantheon so we figured it would be an opportune time to stop in. 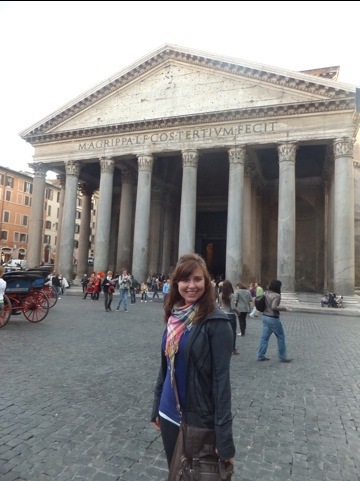 The Pantheon is the only ancient building in Rome continuously used since it’s construction. The Pantheon was the religious for ancient Romans and after the fall of Rome It became a church dedicated to the martyrs. This means that you can find some mixed iconography throughout. The interior is open and spacious, which allows you to get a feeling for how massive the structure is. Everything is marble covered with hues of green, red & white. But the most awe-inspiring part of the Partheon is the building itself. The dome is 142 feet high and wide, Europe’s biggest until the Renaissance…and this was built hundreds & hundreds of years before! The front portico is composed of a Greek style triangular roof held up by hulking columns. Each column is 40 feet high and cut from a single piece of granite. 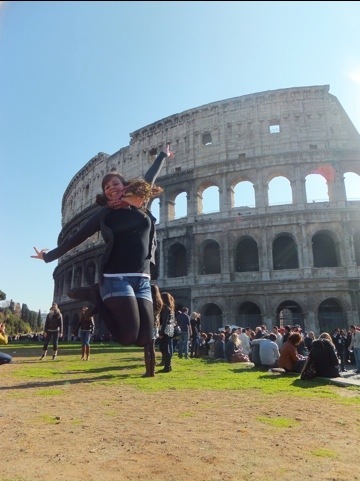 Basically the place is an amazing engineering feat…which is why Kristin loves the Romans! The walk ended at the Trevi Fountain again, so we sat ourselves down on the lowest level where we were somewhat out of the madness. The amount of people surrounding the fountain had almost doubled in the handful of hours between our visits…it still was nowhere near what Mom & Pops Padget experienced, but it was amazing to see what a difference a few hours makes. We had fun snapping a few more photos, but we mainly used this opportunity to people watch. We noted that most people use the correct coin throwing technique, although not everyone is fully informed, and that everyone takes not only the coin throwing picture, but also the “now let’s re-enact it so I can get one where don’t look like an idiot” coin throwing picture. 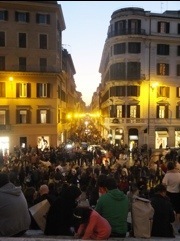 When things got a little too busy for our liking we headed back to the Spanish Steps. There we loitered in classic Kristin & Justine fashion. This attraction was also busier, but they are a vast set of stairs and there was still plenty of room to squeeze our cute bums in. Here we continued people watching and wrote on a batch of postcards. There were lots of “We’re in Rome” and “Miss you lots”‘s recorded. We have come to the conclusion that Rome is walkable, so we headed back towards the hostel on foot. We don’t have a very good map, so Rick Steves was acting as our guide (we were piecing together information from all of his random area maps). Eventually we stopped at a local eatery for supper. They had a nice tent outside that was trapping the heat…it was quite nice out today, but got a bit nippy after dark when we were only in our cardigans. 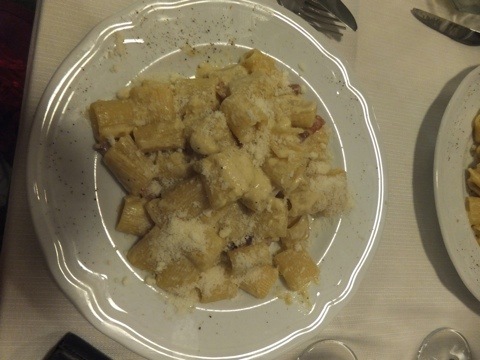 We both went for the carbonara pasta, which was called, in the English description, ‘small pasta’. Upon returning to our hostel we were able to fully check-in and go to our room. Turns out we have a private…heck yeah! We did celebratory high kicks…Justine fell down…Kristin nearly died laughing (like literally, remember she has border-line pneumonia). All in all, a fun time. Today was a really good day. Rome has filled us with a renewed touristy urge that we didn’t think we could have any more by the 4th month of traveling. Over & over today we experienced that “Oh my god, we’re in Europe” feeling that we can only compare to our first day. It was the same sense of wonder we felt crossing the Westminster Bridge and sitting writing our blog post in Trafalgar Square. Basically we are so psyched to be here and are ready for two more awesome days! – Geographically we live so much further north than the Great Lakes!